Dialogue writer Prasoon Joshi’s rhyme game in Manikarnika is so on point in this ferocious exchange between a British commander and an Indian soldier that we – the audience – are left clueless. Should we be sporting a smug face or rather roll our eyes out? Trust me, it is hard not to feel patriotic in a cinema hall filled with momentary nationalists who are reliving those eighth standard history lessons with a bucket of popcorn. Coming back to the dialogues, there are many more gems that Joshi propel through the course of the film. Your next house party goal should be to watch Manikarnika over a drinking game where everyone takes a sip the moment somebody utters ‘Matrubhumi’. 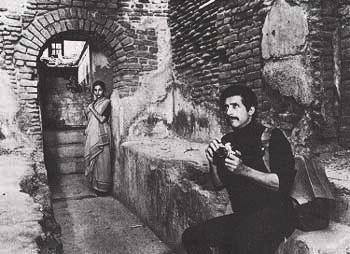 The screenplay (also by Joshi), which lacks any kind of cinematic flow, is akin to a PowerPoint presentation that lists certain incidents from the nineteenth century. Before we go off track, let me tell you that Manikarnika directed by Kangana Ranaut and Radha Krishna Jagarlamudi (Krish) is meant to be a fine chronicle of India’s legendary warrior queen Laxmi Bai’s life. Penned by K. V. Vijayendra Prasad (of Baahubali fame), the film kicks off with a scene were a valiant Manikarnika (Ranaut) is rescuing a village from a predatory tiger. The staging, the acting and the animation are so in the Baahubali zone that we, for sure, know where this film is heading. There are times where we ponder how Baahubali was a mere fantasy feature within which all the kitsch quotient seemed perfect but, boy, Rani of Jhansi and her compatriots fetched us grades in high school. They were real people who did wonderful things for the nation. If we subtract the martial arts bit, was the fiery queen of Jhansi anything like Ranaut is in the film? I refuse to believe. Perhaps I have had a better, brighter picture of Laxmi Bai made up by my (then) creative, young mind. For once, I thought I would give Ranaut the benefit of the doubt. Soon came the slew of hairstyles – bouncy curls, side-swept curls, soft curls, straight ironed, wavy, permed. You literally take a women’s salon menu and our Laxmi Bai sports nearly each one of them in the film’s not-so-brief runtime. The DOPs (Kiran Deohans, Gnana Shekar V.S.) believe in surplus low-angles so that Laxmi Bai’s stature stands enhanced – something that Ranaut’s diction or gait simply could not. Her brittle speech and demure frame quickly reminded me of Aishwarya Rai’s swordfight scene in Jodhaa Akbar. I would have loved Ranaut in a similar mould but epitomizing Laxmi Bai is a different ballgame. Manikarnika shows its protagonist being married off to Jhansi. It is ruled by a king called Gangadhar Rao (Jisshu Sengupta) who is of the frail sorts and wears bangles for a bizarre reason. Their marriage ceremony is on and Manikarnika takes a chide at the priest. I nearly jumped telling myself, “Tanu (Tanu Weds Manu) would have done the same thing,” In a later scene, you see her in splits with her husband and you realize that she was better off doing the same with that handsome Russian dude somewhere in suburban Amsterdam (Queen). That said, I would any day go hunting for a bottle of ‘heeng’ with this naïve-looking girl rather than on a mutiny to overthrow the British. Well, there is more to this film and its never-ending attempt to make sense. Laxmi Bai is a kind queen who meets the village folk and pays no heed to caste and class differences. She even does an impromptu night gig with them in a song that crazily borders on item number territories. She breaks free from an oppressive Rajmata and shatters traditions to safeguard her countryfolk. (I could hear a couple of claps at this juncture and understandably so). 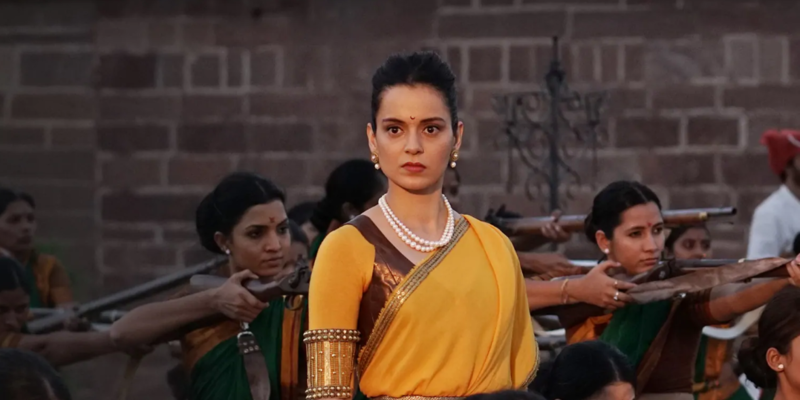 Later, amid kilograms of designer jewellery and sarees with extra-long pallus, Manikarnika also underlines Kangana Ranaut’s (and our society’s) idea of women empowerment. The queen encourages every woman in the province to get trained in artillery so that they combat the enemies with a stealthier force. I am not stating how Laxmi Bai could not have done this in the advent of an emergency. She must have. What makes it hilarious is Ranaut and team’s method to do it all with some choicest slogans emanating from Prasoon Joshi’s pen. Strangely enough, Manikarnika is also a film with zero sense of time and place. The same women soldiers who had once attained martyrdom or were severely wounded in Jhansi reappear in the final climactic fight sequence. Well, I have heard about womenfolk acing their multi-tasking game but here they emerge from the dead for the cause of the nation. Amen to that! Here is some dope on the villains. Besides the inevitable and hopelessly evil East India Company, how can Manikarnika miss the regular Indian equivalent? Zeeshan Ayyub plays the power-hungry cousin of Gangadhar who blurts out (obvious) lines such as “Main kisi aurat ke saamne sar nahi jhukaunga”, “Main aapka wafaadar raha hoon” and others, only to be shown the door by the British eventually. The character is as uncreative as his shaky faux moustache and Ayyub is as whiny as he is every film of his. To Ranaut’s credit, we sense how intuitive is she as an actor. Perhaps knowing her limitations to embrace Laxmi Bai in all her might, she chooses to play a little less to the gallery in scenes that do not involve action. As the end credits roll, you do acknowledge her efforts to become the legendary queen but her directorial skills, certainly, play major a spoilsport. She manages to extract an extraordinary soundtrack from Shankar-Ehsaan-Loy which is amongst the most melodious in recent times. For the rest, Manikarnika does not know where to stop – be it in its slogan-game, intensity of violence or in the use of humour. It often forgets Manikarnika, while being a film, is also based on a person who lived a fruitful, valiant life which was not an Amar Chitra Katha comic strip but a golden chapter in India’s history. In Ranaut and Krish’s film, you do not feel for its people. The most revolted I felt was when Captain Gordon burnt down an immaculate library in the Jhansi place. Previous Post“Thackeray”… An exquisitely photographed biopic that chooses to play safe! Next Post“Mary Queen of Scots” might be forcefully woke but is refreshing in parts!